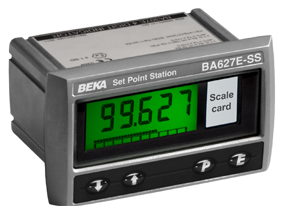 Setpoint stations enable manual 4-20mA control from within a process area. Typically used for proportional control valve actuation, speed adjustment, etc., these setpoint stations are loop powered, and can be calibrated in engineering units. Intrinsically safe hazloc and general purpose versions offer identical features and optional backlighting. New E-series models with push button control have a full 5-digit display plus bar graph. They can also be used with an optional rotary encoder for separate panel mounting. Up to five regularly used settings may be configured for quick access, and the rate of change relative to input can be adjusted to avoid process upset. or Ex t panel enclosure without invalidating enclosure certification.